If you follow me on Twitter (@lilblogofbeauty) you may have noticed that recently I've been desperate to start painting my nails with dark shades, the darker the better. When I was having a wander round Selfridges before the beauty blogger discovery evening (post here) I came across Ciate's new Haute House collection and I instantly fell in love. I really wanted to buy the set, which isn't that expensive at £22 for five mini nail varnishes, but at that time I couldn't afford it so I dragged myself away with a heavy heart. I don't go to TK Maxx very often but I do nip in occasionally to see if there's any bargains to be had. I was having a nosey round the nail varnishes, making sure to avoid any that looked particularly dodgy, when I spotted some box sets. I picked up one Ciate set, which I believe was the Dolls house one that contains pastel shades, but as I said my craving is currently for darker than dark shades. It was then that I spotted them, two darker boxes that made my heart flutter as soon as I saw them. Yes, in TK Maxx they had two boxes of the brand new, just released in September, Haute House collection. I'm pretty sure TK Maxx is all about past seasons stock, so I'm not sure why they were there, but was I going to complain? Obviously not! I turned the box over to find that magical price sticker which said RRP £25 (close, it's actually £22) our price £6.99. Yes, just £6.99! So of course this little beauty came home with me. Oh Ciate, aren't you naughty! 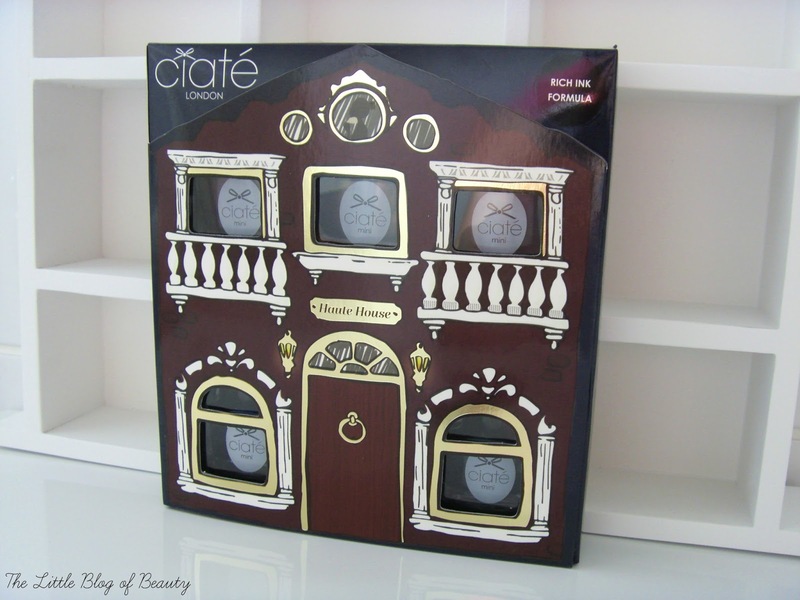 I love the 'house' style packaging that Ciate's themed sets come in and this one features lovely deep autumn/winter appropriate colours that match the shades inside. The front of the house features a magnetic flap (you can see the magnet taped inside the box!) that opens to give you a better view of the nail varnishes inside. I just know that this is packaging I'm going to struggle to part with so I think I might just keep the nail varnish inside it. Due to the shades being very dark, bad lighting and my camera not being that good I did struggle to try and get good pictures of the shades, the bottom picture is the best. I'm sorry there's only four there, the fifth one just did not want to play ball! But take my word for it they are amazing winter shades. Can can is a deep purplish-red Clarat colour, For the thrill of it a bronze with flashes of yellow/green in the shimmer, Sass pot a deep Caburys purple, Knee highs a deep inky blue, and Tickle my fancy a petrol blue/green. I was quite surprised to find that they don't all apply the same. Can can, Knee highs and Tickle my fancy all apply really well and you could easily get away with just one coat. For the thrill of it is actually very thin and the first coat looked very watery, but three coats gives a good coverage that is on par with one coats of the other shades. I'm not quite sure yet if there may be something wrong with my Sass pot as the first coat applied very watery and a strange kind of dark grey colour. I gave the bottle a really good shake and on the second coat I did start to see signs of purple. I went for three coats of this one and it's very dark, almost black, but I'm not sure if this is because I started off with the strange watery grey 'base'. I will try this one again and see if it comes out better next time. So far I've only actually worn Knee highs briefly on my nails (I wanted to get this post up ASAP so you can check your local TK Maxx if you want!) but after just over a day it hadn't chipped at all (doesn't sound much but is good for me) and it looks amazing on the nails. 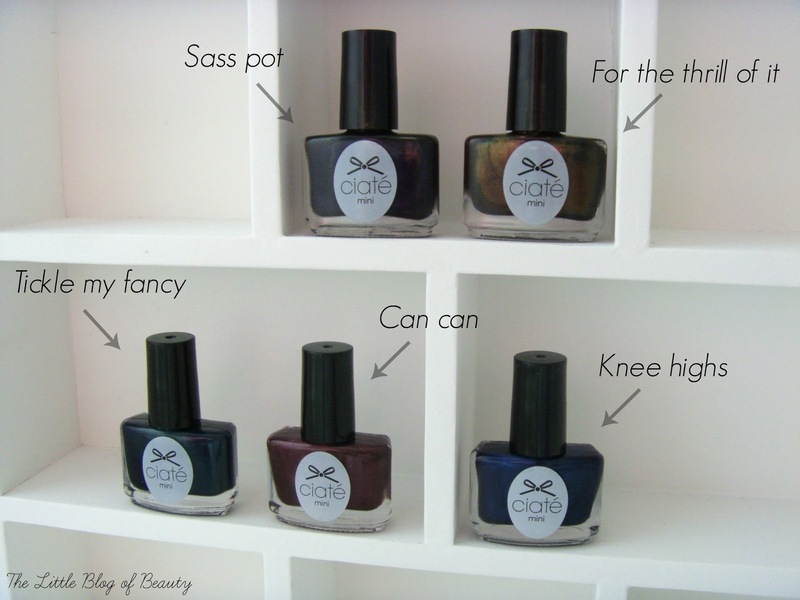 While writing this post I've applied Can can and oh my it's such a gorgeous shade. I'm so happy with this and would happily have paid £22 for it, but obviously I didn't have to! Will you be picking up the Haute House collection? This is so cute! I love the look of this, and the shades are so pretty! Oh wow this looks so amazing, definitely need a trip to TK Maxx! This is so cute. Knee Highs is my favourite shade, it looks so pretty!